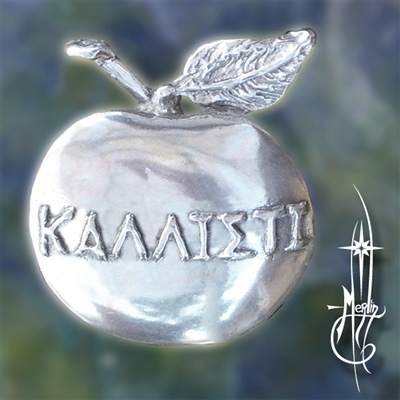 The Kallisti Amulet has been a source of humor for centuries. and started disputing who it was for. accepting Helen’s hand for a bride. left the city as her lover and sailed with her to Troy. and enjoy a practical joke now and then. An amulet of mischief and humor. has been a source of humor for centuries. accepting Helen’s hand for a bribe. as her lover and sailed with her to Troy. Hera, Athena and Aphrodite saw this piece of art and started disputing who it was for. Disgusted by the constant bickering, Zeus sent them to Mount Ida near Troy to be judged by the shepherd Paris, who chose Aphrodite as the most beautiful, accepting Helen’s hand for a bribe. Paris, having come to fetch his bribe at Sparta, where Helen was queen, left the city as her lover and sailed with her to Troy. But her husband Menelaus and his brother Agamemnon took great exception for this theft, sent a powerful army against Troy; and the rest is history. This symbol is a favorite of those fans of the Science Fiction Trilogy by Robert Anton Wilson: the Illuminati; and is hailed by the Discordians: a movement that pops up now and then who attend such conventions and festivals and enjoy a practical joke now and then. An amulet of mischief and humor.